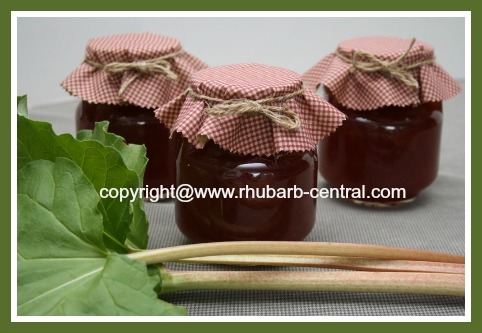 This Plain Rhubarb Jam Recipe can be made with fresh OR frozen rhubarb. If you cannot wait until spring and you have frozen rhubarb on hand, make this classic jam with your freezer supply of rhubarb. 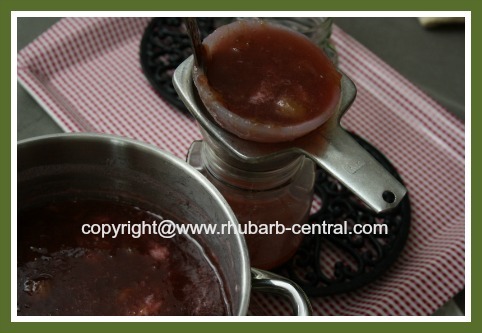 For a variation, you can add mint or rose water to the rhubarb if desired (see below). Want to make the fabric jam jar covers yourself too? 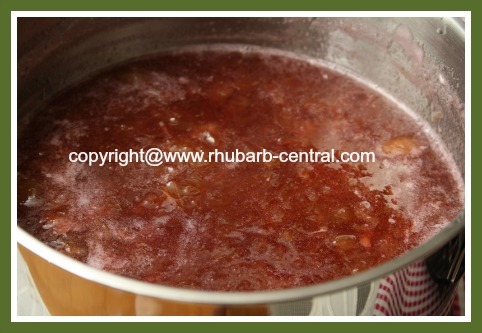 In a large pan, combine the finely chopped rhubarb and the water. 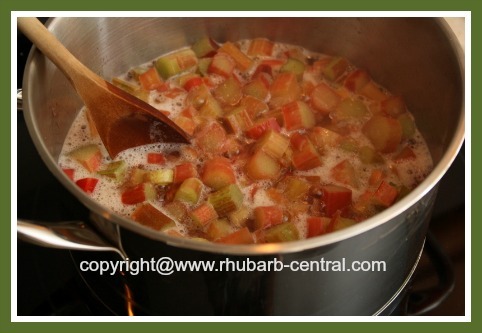 Reduce heat to medium and allow mixture to simmer, covered, for about 2 minutes or until the rhubarb is tender. Gradually stir in the pectin powder until dissolved. Return the mixture to a full rolling boil over high heat, stirring constantly to avoid sticking and burning. Add the sugar in a steady stream, stirring constantly. Return to a full boil, stirring constantly to dissolve the sugar. Boil hard for 1 minute, stirring constantly. Remove from heat and skim off any foam. Ladle jam into sterilized jars to within 1/4" of the rim, wipe rims. Apply prepared lids and rings, and tighten rings just until fingertip-tight. Process the jars in a boiling water bath /canner for 10 minutes. 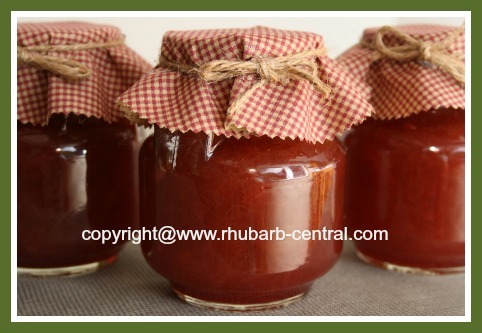 Transfer the filled jars to a towel-lined surface and allow to rest at room temperature until set, about 24 hours. Date jars and store in a cool dark place. Makes about 6 - 8 ounce / 250ml jars of delicious jam, or 3 - 1/2 litre jars. Add 1/4 cup finely chopped fresh mint after stirring in the granulated sugar. Add 1 tbsp. finely grated gingerroot to the rhubarb before cooking. Add 1 tbsp. rose water after skimming off the foam. Here, below are canning supplies available for online purchase at *Amazon.com. Click on the images below for more detailed product information and customer product reviews.